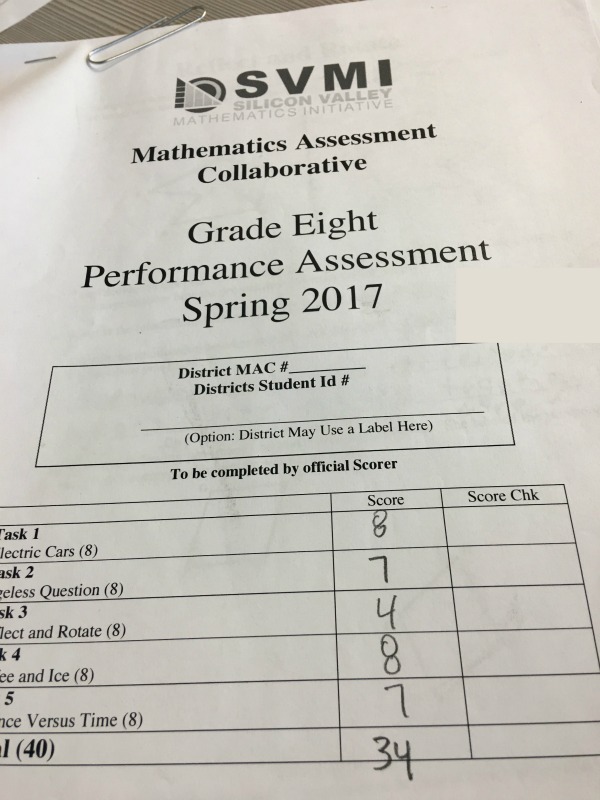 We finally got math assessment results from the tests Smarty took in the end of the first trimester. The question is now, where do we go from here? I have to start by saying that it pains me to always have to ask our school to do anything extra for Smarty. I envy parents and students in schools who take more proactive approach in supporting individual needs of their students. In our case, it took a meeting with the teacher and a meeting with a principal to just agree that our daughter needs an assessment to establish her true level of math understanding. Eventually, it was granted, and Smarty knocked out 10 assessment tasks (5 for 7th grade and 5 for 8th grade) in 2 days. These tasks are not simple calculations - each task is an extended word problem with multiple steps to be performed and explained. Interestingly, Smarty got 34 out of 40 points in 7th grade assessment and 34 out of 40 points in 8th grade assessment. We could not get a copy of her assessment, because the tasks themselves are "top secret", but Smarty's teacher left it for me to look over when I came in to teach my Math team. I could see looking through 7th grade assessment that she rushed through it. If she used a calculator (it was allowed) and checked her work, she would have probably received 38 or 39 points on it. 8th grade was more interesting to me as it clearly showed a gap in a specific topic - a gap that she will eventually need to close. Smarty said that her teacher went with her over the results and said that she did very well and her scores were the same as average scores of the graduates from the advanced program of our main middle school. It's rather amusing considering that she could be in the fifth grade right now based on her age. As it were, we need to decide what to do next to keep her challenged and learning. In the good news department, our administration finally woke up to the fact that students leaving STEAM school should have the same opportunity to accelerate as their counterparts in our mainstream non-STEAM school. It looks like this acceleration will be offered in the form of online curriculum even though I don't know at this point what this curriculum will actually cover and when the program will start. Our principal has mentioned in the last School Site Council that they are working with our high school district to ensure that it will accept the credit from an online program as a credit from the first year of high school before rolling it out. We are currently on the fence as to whether to wait for that to happen or insist on independent study now. On one hand, Smarty says that she would like an independent study on her level, on the other hand, she is still enjoying her math teacher and some of the activities in the classroom. For now, we have asked our math teacher to meet and discuss options and we hope that some sort of path forward will be found before the Christmas break. 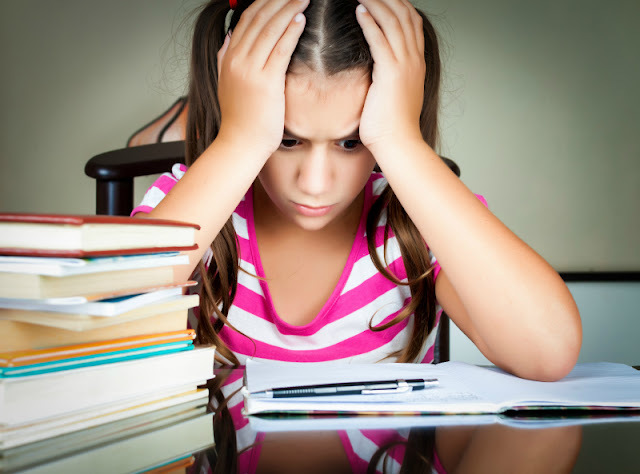 If your children go to a "brick-and-mortar" school, is it receptive to their needs? Tough choice! If it were me, I would leave my child in the collaborative setting to learn group skills without having to worry too much about the math and do one-on-one tutoring outside of school. But I suppose doing online work for credit would alleviate the burden of you having to teach her and she can take advanced courses in high school. What advanced courses does your high school offer? That could help figure out what to do. Our local public school has zero interest in accommodating a student like Smarty.